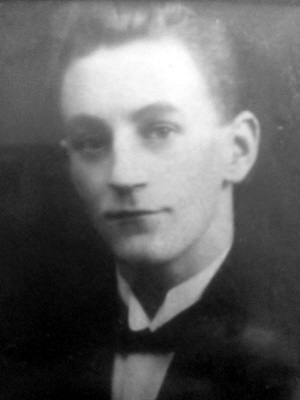 Jesse Birkinshaw was born in Ossett in early 1898, the second child and first son of Jesse Birkinshaw and his wife Sarah (nee Stephenson) who married at Batley All Saints Church on the 16th November 1889. In 1901, Jesse Birkinshaw senior, a butcher by trade, and Sarah were living with their three children, all Ossett born, at Shepherd Hill, Ossett. In 1911, Jesse Birkinshaw junior was living with his younger brother, Cornelius, at his slightly deaf widowed grandmother’s house on Wakefield Road, Ossett. Jesse Birkinshaw senior and his wife were living nearby in a two-roomed house. In the early 1900s, the Birkinshaws had a further four children, all girls and the couple now had five girls and two boys. Two more children had died before April 1911. On the 14th February 1920, 21 year-old Jesse Birkinshaw, a general labourer, married Ivy Allen at Ossett, Holy Trinity Church. Jesse, of 87, Wakefield Road, Ossett died later that year from the effects of trench fever and was buried at the same church on the 23rd November 1920, aged 23 years. "Ossett Hero's Death - The death took place on Saturday last of Lance-Corporal Jesse Birkinshaw, of 87, Wakefield-road, Ossett. The deceased served in the late war with the 8th Battalion Black Watch with distinction, gaining the Military Medal for gallantry on the field. He worked a machine gun by himself after all the other members of the gun crew had been killed. A few days later he was dangerously wounded, and he was also gassed four times. He was formerly a scholar at Flushdyke school and in later years was a very useful worker with the cause at the Bethel Chapel, having been a member of the choir for some years. He was buried in the parish churchyard with military honours on Tuesday, the large attendance testifying to the esteem in which he was held. The coffin, which was covered with the Union Jack, was borne by soldiers from the church to the grave, and at the close of the service the buglers sounded the 'Last Post'. During the progress of the cortege from the house to the church, the children of Flushdyke school lined up on the road as a tribute of respect." Since Jesse Birkinshaw was born in 1898, and the minimum age for a soldier in the British Army was 18 years, it is most likely that he enlisted in the army in 1917, and was posted to the 8th Battalion of the Black Watch, which had suffered appalling casualties at the Battle of the Somme in July 1916. The 8th (Service) Battalion, Black Watch was raised at Perth on the 21st of August 1914 as part of Kitchener's First New Army, and they joined 26th Brigade, 9th (Scottish) Division. Following initial training in the Perth area they moved to Aldershot. In January 1915 they moved to Alton and in March to Bordon. They proceeded to France on the 10th of March 1915, landing at Boulogne and went into action in the The Battle of Loos. In 1916 they were in action in the Battle of the Somme, including the capture of Longueval in which the fierce fighting reduced the 8th Black Watch to just 171 men, The Battle of Delville Wood and The Battle of Le Transloy. In 1917 they fought in the The First and Second Battles of the Scarpe during the Arras Offensive, The First Battle of Passchendaele and The action of Welsh Ridge. In 1918 they fought on the Somme, in the Battles of the Lys and The Advance in Flanders, capturing the Outtersteene Ridge and seeing action in in the Battle of Courtrai and the action of Ooteghem. They were resting in billets at the Armistice. Lance-Corporal Jesse Birkinshaw received the Military Medal around July or August 1918. The award was gazetted on the 18th November 1918, when Jesse was in the 8th Battalion, Black Watch, part of the 26th Brigade within the 9th (Scottish) Division. He survived the war, but died of trench fever in 1920 at his home in Ossett, West Yorkshire. On the 19th July 1918 at Meteren, the 8th Battalion suffered 87 Other Ranks killed, 111 wounded and 28 missing. The attack itself was ultimately successful and Meteren was taken, but Lance-Corporal Jesse Birkinshaw's 8th Battalion, Royal Highlanders (Black Watch) suffered terribly that day. Meteren was occupied by German forces early in October 1914 and on the 13 October, their entrenched positions covering the village were captured by the 10th Brigade of the 4th Division. The village then remained in Allied hands until the German offensive of April 1918. The 33rd Division held it against heavy German attacks on the 13th April, but it was lost on the 16th. The sector was then taken over by French troops for a time, but on the 19 July, the 9th (Scottish) Division (2nd Royal Scots Fusiliers and South African Composite Battalion) recovered the site of the village after a fortnight's bombardment which completely destroyed the houses. 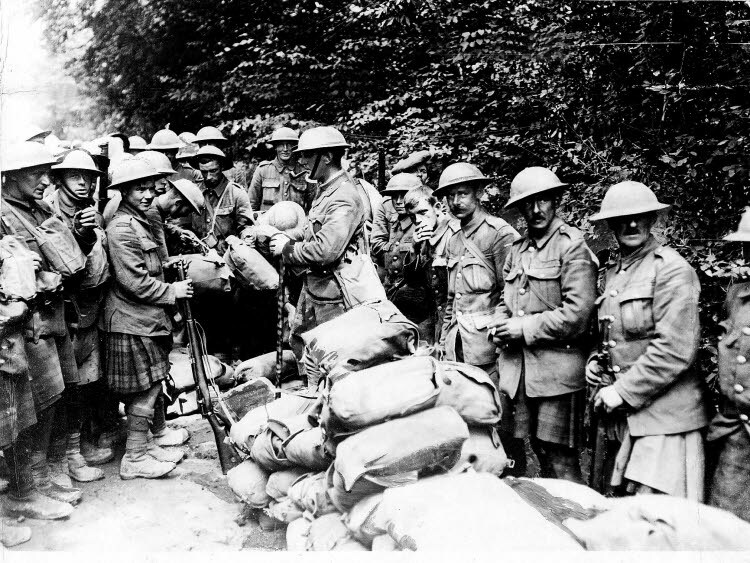 Above: Black Watch soldiers in August 1918, distributing packs amongst the men after battle near woods at Rheims, France. Jesse Birkinshaw's army service record has not survived, but he was awarded the British and Victory medals, but not the 1914-15 Star, indicating that he did not serve overseas before the 31st December 1915. There is no entry on the Commonwealth War Graves Commission website, presumably because his death occurred after WW1 in 1920.